Introduction EMSL Analytical, Inc. is recognizing it's Rochester Lab for its NVLAP accreditation. EMSL Analytical, Inc. is proud to announce the opening of a new asbestos testing laboratory in Rochester, which marks the company’s fourth facility in the state of New York. 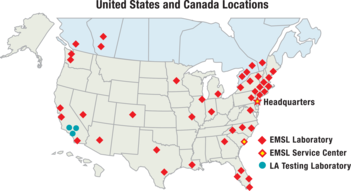 EMSL has expanded to 43 testing laboratories throughout North America and is highly diversified to handle large and varied analysis requests. The Rochester laboratory, managed by industry veteran Peter Donato, has recently been accredited by the National Voluntary Laboratory Accreditation Program (NVLAP) for both bulk and airborne asbestos fiber analysis (NVLAP Lab Code: 600183-0). Through the NVLAP program, laboratories are accredited in accordance with International Standard ISO/IEC 17025. According to NVLAP, the accreditation demonstrates technical competence for a defined scope and the operation of a laboratory quality management system. EMSL Rochester is located at 2975 Brighton Henrietta Town Line Road, Building 100, Suite 130. The laboratory can be reached by calling (585) 957-9436. For more information about EMSL’s asbestos services and other laboratory testing options, please visit www.EMSL.com or www.AsbestosTestingLab.com, call (800) 220-3675 or email info@emsl.com.